1900-1913 Borgfeldt Dolly Face doll, 12-36" tall, bisque socket or shoulder head doll with kid, cloth or composition body. Bisque doll face shown is on a 24" tall composition jointed body, open mouth with teeth, sleep eyes, beautiful braided coiled wig. George Borgfeldt & Company was located in New York City USA and founded by George Borgfeldt (b.1833 - d.1903), Marcell and Joseph L. Kahle, as a doll importer, doll assembler for American and Canadian markets and a doll distributor. Borgfeldt held the distributing rights to many dolls from European manufacturers such as: Bähr & Pröschild, Buschow & Beck and Karl Standfuss, Heinrich Handwerck, Käthe Kruse, Kammer & Reinhardt, JD Kestner, Armand Marseille and Steiff, plus others. 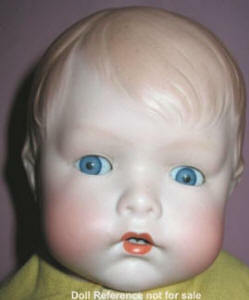 Borgfeldt bisque doll heads were made for them by several German doll makers; Alt, Beck & Gottschalck, Kling & Co., Armand Marseille, Max Schelhorn and Simon & Halbig. Borgfeldt also distributed American made dolls for; Aetna, Averill, Bergfeld & Son, W. Bimblick & Company, Dreamland Doll, Cameo, K & K or K and K Toy Company (also owned by Borgfeldt), Metal Doll Company, Jeanne Orsini, Tip Top Toy and many other USA doll makers. 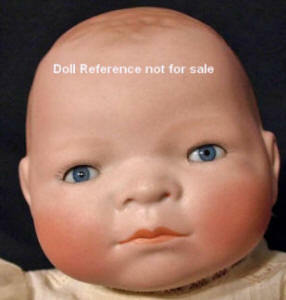 Some Borgfeldt distributed Dolly faced dolls have their name in the marking: Alma doll, Duchess doll, Florodora doll, G. B. doll, Just Me doll, Little Sister doll, My Dearie doll, My Girlie doll, My Playmate doll, Nobbi Kid doll and Pansy I, II, III, IV doll. 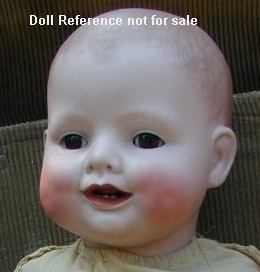 Some of these names are known dolls made by Armand Marseille. My Girlie doll mold 1362 is by ABG - Alt, Beck & Gottschalck. 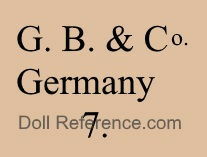 Some dolls distributed by Borgfeldt may have a G. B. or GB & Co in their marking, others will not and have only the marking from the manufacturer. 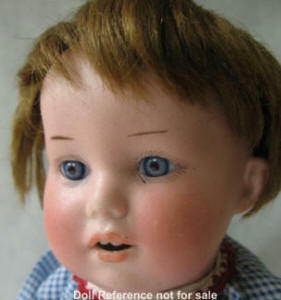 Borgfeldt is best known for commissioning and distributing the very successful Rose O'Neill, Kewpie dolls and Grace Storey Putnam, Bye-Lo Baby dolls. K & R Kaiser Baby doll mold 100, 11"
Character Baby Doll mold 251, 11"
1922+ Bye-Lo Baby, 9-20" tall, white doll, all bisque doll, bisque and composition, celluloid or wooden head with cloth body, sleep eyes or painted eyes. Designed by Grace Storey Putnam, based on a three day old newborn child. Several different markings depending on manufacturer; Copr. by Grace S Putnam Germany 1415/48, © 1923 by Grace S. Putnam Made in Germany or 20-10 Copr. by Grace S. Putnam Germany or BYE-LO BABY Reg. US Pat. Off. K and K Copyright 1922 by Grace Storey Putnam (all inside a circle). There is a rare antique black bisque head Bye-Lo doll who is marked with the mold 1415, all the other black Bye-Lo dolls are reproductions, see also below Cameo. Bye-Lo Baby doll bisque heads were made by Alt, Beck & Gottschalck (doll molds 1369, 1373), JD Kestner, Kling & Co., Hertel, Schwab & Co, composition heads by Cameo (made a rare composition black Bye-Lo doll), celluloid heads by Karl Standfuss, wood heads by Schoenhut, all bisque dolls made by Kestner, cloth body dolls made by K & K or K and K Toy Co., composition body dolls made by König & Wernicke. 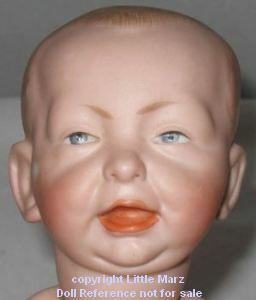 1925 Borgfeldt Baby Bo Kaye doll, 16-20" tall, designed by Joseph L. Kallus of Cameo for George Borgfeldt, bisque head by Alt, Beck & Gottschalck, or celluloid head, lightly molded painted hair, sleep eyes, open mouth with two lower teeth, cloth body with composition limbs. 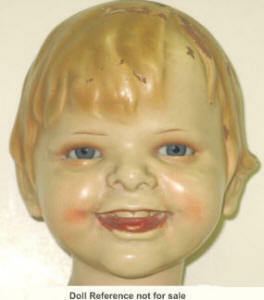 The bisque head ABG doll mold 1407. Doll mark: Copr. by J.L. Kallus Germany 1394. 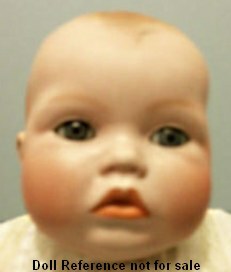 There were also small all bisque Baby Bo Kaye dolls , 5-8 1/2" tall, with ABG doll mold 1407. The theory of the Baby Bo-Kaye doll name is that when the President of Borgfeldt and designer Kallus were trying to arrive at a name, a secretary came in carrying a "bouquet" of flowers, cute. 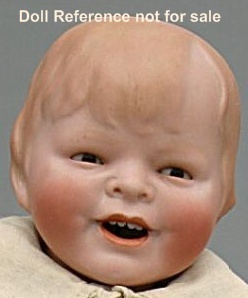 1926 Bonnie Babe, 8-23" tall, bisque or celluloid head, open smiling mouth with two lower teeth, cloth or composition body, ABG doll mold 1386, 1402. Bisque heads were made by ABG; Alt, Beck & Gottschalck. 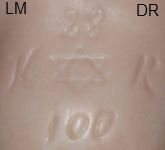 Doll Marking: Copr. by Georgene Averill Germany 1005 3652 1386. (Borgfeldt was the distributor for Averill). There were also tiny 5-7" all bisque Bonnie Babe figurine dolls. 1929 Borgfeldt Gladdie doll, 18-24" tall, designed by Helen W. Jensen, doll shown is 22" tall, biscaloid (composition that looks like bisque) head with molded painted hair, blue glassene set eyes, open smiling mouth with upper teeth, cloth body with composition limbs. 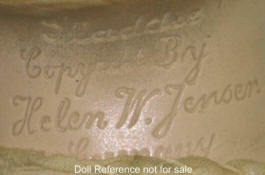 Some doll markings are: Gladdie Copyriht By Helen W. Jensen Germany. 1929 Borgfeldt Gladdie doll, 18-24" tall, designed by Helen W. Jensen, this is the bisque head version of Gladdie; bisque flange head with molded painted hair, glassene set eyes, open smiling mouth with upper teeth, cloth body with composition limbs. Bisque head doll mold 1410 by ABG. Doll mark Gladdie. 1931 Borgfeldt Babykins doll designed by Grace S. Putnam, 17" tall, bisque flange head with lightly painted molded hair, single stroke brows, painted upper and lower eyelashes, blue sleep eyes, very full closed mouth with prominent lips, cloth body arms and upper legs, composition hands and lower legs, doll mark Babykins Copr. by Grace S. Putnam Made in Germany 1435. 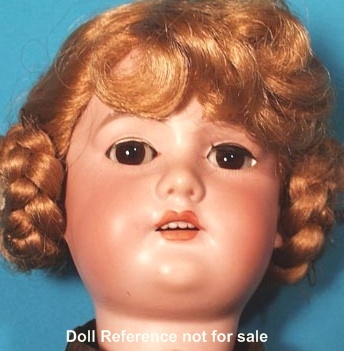 This is the hardest to find and a rare Grace S. Putnam doll. 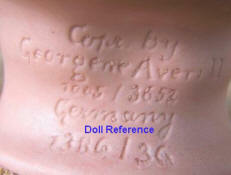 ABG - Alt, Beck Gottschalck is a likely supplier of doll mold 1435. 1909 Aetna's Can't Break-Em dolls, Alida Dutch Steiff doll, Irvington doll, Commander Lieutenant Peary doll. 1912 Minnit Baby doll mold 971 Marseille, My Girlie doll mold 1362 ABG, Tiny Tots 10 & 16"
1913 Dotty doll, Happifat doll, Little Sister doll mold 326, Prize Baby doll, Cubist doll, Peero doll, Jolly Kids doll, Butterfly doll, Carrie, Willy doll, Kewpie doll by Tip Top Toy. 1914 Blue Bird doll clothes, Nobbi-Kid doll, Oh You Kid doll, September Morn doll Drayton, Mama's Angel Child doll, Bettijak doll, Little Miss Sunshine doll, Little Sister doll, Tommy Atkins doll. Skookum doll, Knock About dolls. 1919 Miss Yankee doll, Splashme doll, Tissme doll, Tumble-Bo doll, ** Poutie doll, Winkie doll. 1921 Jackie Coogan doll, Teenie Weenie doll by Amberg, Vanitie doll by Metro. 1922 Betsy doll, Mimi doll, Reg'lar Fellers doll by Gene Barnes, Sugar Plum doll, Teenie Weenie doll, The Skipper doll, Vivi doll by Orsini. 1923 Averill dolls, Bedtime doll, Happy Hooligan doll, Daisy doll, Nifty doll, Peter Rabbit Acrobat doll, Powerful Katrinka doll, Rose Marie doll by K & R.
1924 Bringing Up Father doll, Buttercup doll, Felix the Cat doll, Whatsamatter doll. 1925 Koko doll, Little Annie Rooney doll, Babes in the Woods dolls, Jack and Jill Story Book dolls by Sol Bergfeld, Jackie Coogan Ragman doll, Just Me by Marseille. 1926 Baby Smiles doll, Buttercup doll, Featherweight doll, Hi-Way Henry doll, Lillie doll, Paddy Potato doll, Rolly-I-Tot doll. 1928 Bonzo the dog (by Cameo), Fly Lo Baby doll or Aero Baby doll mold 1418, Mignonne doll, Minnie Spinach doll, Sugar Plum doll, Tommy Turnip doll, Charlie Carrot doll.